From Washington, D.C. - Take State Route 4 east from the Washington Beltway to State Route 2-4 to Solomons. From Baltimore - Take Interstate 97 south from the Baltimore Beltway, to State Route 3 and U.S. Route 301 south to State Route 4. Continue south/east to State Route 2-4 to Solomons. You can also take I-97 south to the Aris T. Allen Boulevard exit (Route 665), then follow signs for Solomons Island, Route 2 South. Go south on Route 2, following signs for Prince Frederick. Route 2 will join with Route 4 - make a left from Route 2 onto Route 2-4 south. Follow Route 2-4 south/east to Solomons. From Richmond - Take U.S. route 301 north into Maryland, then State Route 234 east to State Route 5, south on State Route 5 passing Leonardtown, left on State Route 4 across the Thomas Johnson Bridge (lower Patuxent River Bridge) to State Route 2 at east end of the bridge. Solomons Island Heritage Tours is conveniently located on Main Street in Solomons Island, Maryland. 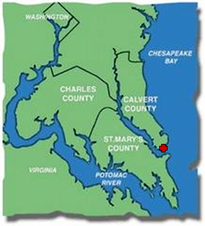 We will meet your group at the County dock behind the public restrooms and Calvert County Sherriff field office located approximately 3/4 of a mile on the left side of Main Street, across from the Gazebo on the boardwalk. Public parking is provided on the boardwalk side of the street.